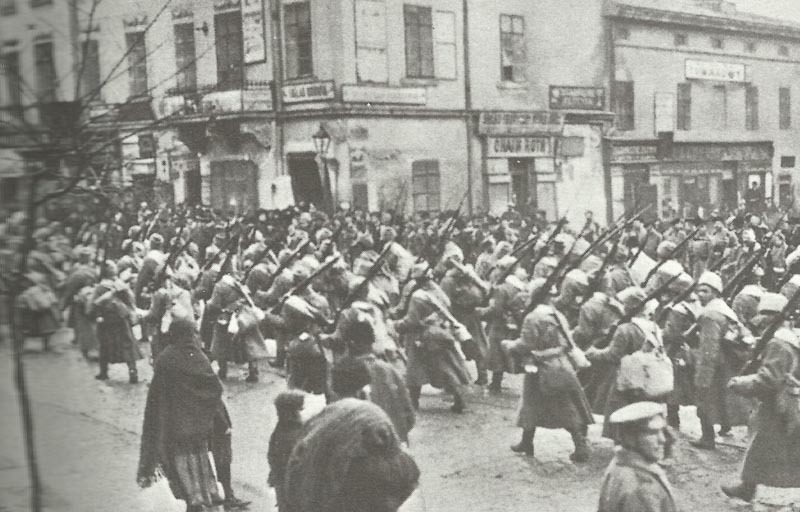 Russian troops march through a town in Galicia in an attempt to block advancing enemy forces. Galicia: Russians retake Krasna and next day also Stanislau, claim 19,000 PoWs since February 21. Flanders: 1st Canadian Division enters line, takes over Fleurbaix sector south of Armen­tieres, aids Neuve Chapelle attack on March 10. Artois: ­German division counter-attack retakes Lorette ridge crest and drives French into Buvigny Wood, but French recover most ground until March 5. Persia: c. 800 British soldiers with 4 guns lose 189 men and 1 gun as casualties to Turco­-Arab force (c. 800-900 casualties) in vain attack near Ahwaz. Dardanelles: Royal Navy landing party destroys 6 field-guns at Sedd-el-Bahr while 4 British battleships shell Fort Dardanus (South shore). Germany: French bomber unit MF29 (Happe) bombs Rottweil gunpowder factory (repeated on March 12). USA: National Advisory committee for Aeronautics (NACA) founded. German Fatherland advertises souvenir Iron Crosses (1,500 already sold to fund widows and orphans). Britain: British War Council discuss Constantinople’s future, Churchill even suggests hiring Turk Army as mercenaries against Austria after its capture. HM Ambassador in Petrograd cables that Russia ‘could not consent to Greek participation in operations at the Dardan­elles’. Royal Family at horse show.